(2)Professionally serge edges for durability, and 3.2 inch Rod Pocket for easy hanging. ShinyBeauty maufacture varies of sequin backdrop, includes (Mermaid Sequin Backdrop; reversible sequin backdrop;Mermaid Sequin Curtain;Sequin Backdrop Gold; 3FTX6FT Sequin Backdrop Curtain,Sequin Backdrop Gold,sequin backdrop 2FTX7FT,30ftx10ft Sequin Backdrop Champagne Gold,Champagne Gold sequin backdrop,sequin backdrop Champagne Gold,sequin backdrop for photography,sequin backdrop fabric,backdrop wedding decoration,gold sequin backdrop 7x7;gold sequin backdrop 8x8;silver sequin backdrop 10x10;silver sequin backdrop 8x8;black sequin backdrop 10x10 Etc. 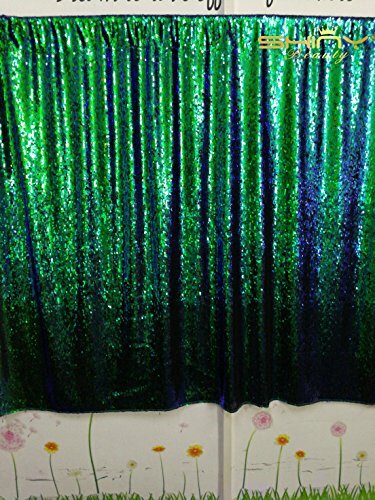 What You Get: 1PC Green＆Black 10FT Wide By 10FT Height Sequin Curtain Backdrop. Best Quality & Lowest Price. From ShinyBeauty, America's Leading Sequin Backdrop&Tablecloth Brand on Amazon. Sequin Curtain,Glitz Photogrpahy Background,Sequin Curtain backdrop for Wedding/Party/Birthday/Christmas/Prom Decoration.